Renée Giovarelli of Resource Equity argues that Prindex not only tells us something about how we can improve women's land rights, but helps us to think in a new way about development. This piece was originally published on Duncan Green's blog, From Poverty to Power. A couple of weeks ago Duncan asked a question: How do we, in the international development community, recognize and work with (let alone measure) issues like love, shame, fear, solidarity? Fear and hope – attitudes to the future – matter because they determine how we behave. They might inform decisions about investment in land, and about families: decisions that can shape lives, communities and economies. What’s more, Prindex found that women were, on average, over 12 percentage points more likely than men to express fear for their right to retain their home in the event of divorce or the death of their spouse. This is a land rights gender deficit. In Uganda, the Prindex survey shows that 40 percent of women are insecure about their rights to land in the case of a divorce. This tallies with one of my findings from years ago. 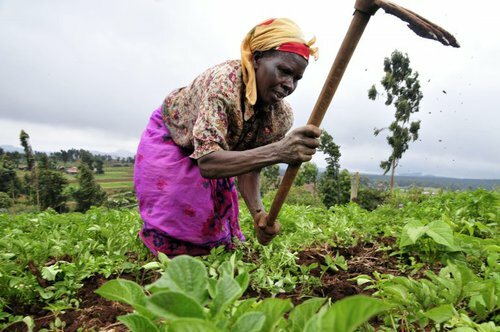 In focus group discussions in Uganda, women openly talked about being beaten before the harvest so that they would return to their family for a while and their husbands could harvest and sell the crops before going to bring them home. In rural India, where Hindu women who divorce are regarded as a shame on their families and where women often receive nothing in a divorce, women talk about having to stay in extremely abusive situations because they have nowhere else to go. Women who contemplate divorce in countries that take into account women’s non-monetary contributions to the marriage – including unpaid work on the land and caring or “reproductive” labour – when dividing property at the time of divorce tend to be less fearful than women in countries that do not count non-monetary contributions. Countries where women display relatively low rates of tenure insecurity in divorce scenarios (30% or below) are all countries in which the division of property benefits both spouses at the time a marriage is dissolved. There are countries such as Liberia, Mozambique and Burkina Faso in which divorce legislation is gender-equal but women anticipate more insecurity in divorce scenarios. This may reflect differences over whether women know of their legal rights, and whether their personal and social circumstances along with the de facto operation of courts allow them to enforce that right. Asking about fear and hope becomes a way to recognise that what appears to be a land law issue is also a family law issue and an issue of norms, courts, and citizen awareness. If we don’t ask about perceptions, and if we don’t make sure that we collect data from women as well as traditional heads of household, we risk neglecting a large part of the picture, and at least half of the population. Renée Giovarelli is Senior Gender Advisor and Lawyer at Resource Equity and an expert on women’s land rights. Prindex is the largest international survey of men’s and women’s perceptions of their land and property rights. The United States has become the first country to officially adopt Prindex as a measure of its success in meeting key land-related Sustainable Development Goal (SDG) 1.4.2.